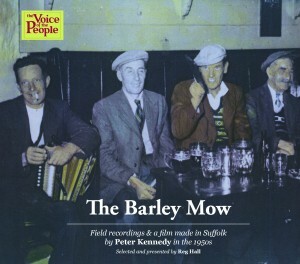 Field recordings and a film made in Suffolk by Peter Kennedy in the 1950s. Selected and presented by Reg Hall. As early as 1949, Peter Kennedy had begun making field recordings of traditional music in the West Country of England on his own initiative and at his own expense with a factory prototype tape recorder lent to him by a friend. During the time the recordings included in this CD/DVD collection were made (1953-1956) Peter was working part-time for the EFDSS and part-time for the BBC, and in his free time he engaged in projects of his own and those he shared with Alan Lomax. Although Kennedy undertook his own recording trips to Suffolk in 1952, he and Lomax did not meet up in Suffolk until October 10th 1953, to record singers at the Ship in Blaxhall, then onto Swefling the following day to record Harry List. Peter had been keen to record traditional music and dance performance on film, and Lomax attended the first day of filming at the Ship in November 1955. June 1956 saw Peter in the area again, this time recording Phoebe Smith, her neighbour Jim Baldry, Bob Roberts, Jumbo Brightwell and Edgar Button. With this wealth of recorded material, Peter laid the foundations for future research into a region rich in traditional music, dance and song. DVD – contains Peter Kennedy’s original 1954 Here’s A Health To The Barley Mow (Folksinging and Stepdancing in a Suffolk public house) film.